Hulk Ultimate Revenge Video Slot Guide & Review - Casino Answers! The Hulk: Ultimate Revenge is a 5-reel, 25-line video slot machine available at Cryptologic casinos as well as Random Logic casinos such as Casino-on-Net. It’s based on the comic book series, rather than the various TV shows or the movies that have featured the Hulk over the years. The Hulk: Ultimate Revenge has a bonus game as well as three progressive jackpots.Play at this years #1 online casino for United States - Slots.LV. The Hulk: Ultimate Revenge has got great comic art graphics, slick animations and excellent sound effects. The substitute (or wild) symbol is the Hulk’s eye. The scatter symbol is an explosion. If three or more explosions occur, you will unlock the bonus game. The Hulk substitutes for all other symbols except for the explosions. All winning combos will pay from left to right only except for the scatter symbol. Bets available on The Hulk: Ultimate Revenge game are $0.05 (minimum), $0.10, $0.25, $0.50, $1, $2, $5 or $10 (maximum). If you’re betting on all 25 lines, the minimum total bet will be $1.25, while the maximum total bet will be $250 per spin. The Ultimate Revenge slot machine is linked to three Cryptologic Marvel progressive jackpots – the Hero Jackpot, Super Hero Jackpot and Marvel Hero Jackpot. As an example, as of this writing, the Hero Jackpot is at $300, the Super Hero Jackpot is at $3,000 and the Marvel Hero Jackpot is at $17,000. You don’t need any matching symbols to qualify for a jackpot. If you want to optimize your chances of winning one of these progressive jackpots, make sure you bet as much as you can per spin. This will increase your chances of winning dramatically. 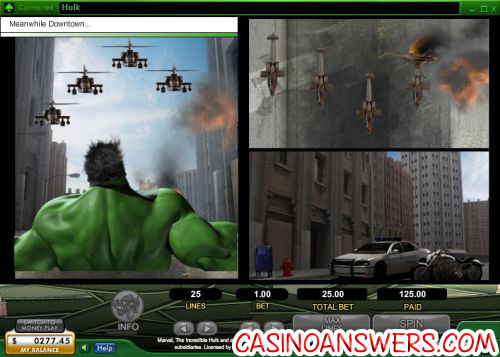 You can find The Hulk: Ultimate Revenge at any Random Logic or Cryptologic online casino. 888.com Casino (also known as Casino-on-Net) is an excellent choice for a place to play this game. Casino-on-Net is one of the oldest and most recognizable online casinos around. For new players, Casino-on-Net offers a 100% signup bonus up to $200. In addition to that, you will be eligible to receive a 10% bonus up to $100 every month for the next 12 months! Is this Hulk video slot based on the comics or the movies? 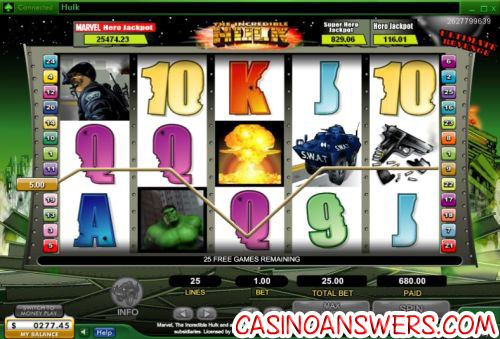 The Cryptologic Hulk video slot found at 888.com Casino is based on the Incredible Hulk comic book series. You also can read our Incredible Hulk video slot review of the game found on the Playtech platform, including casinos such as Casino Tropez. The Playtech version is based on the 2009 film starring Edward Norton as Hulk. What is the Hulk slot? Is there any Hulk marvel slots? Where can I play Hulk games?